Carrickabraghy Castle stands on a greenstone dyke in the north west point of the Isle of Doagh, 1 mile east of the island of Glasheady; it is built of rough quartz rock of the same kind as the rocks within a few yards of it. The principal and western tower is rectangular, the inside dimensions being 10 feet by 8 feet 6 inches. It consists of an upper floor supported by three beams, and a terrace with castellated walls above. Neither the floors or terraces in this or any of the towers at present exist. There is a door on the east side and one on the north now built up, a loophole on the south, the wall being 5 feet thick and the interior dimensions 3 feet 9 inches high by 3 feet 3 inches long, diminishing to a very small outlet. There were other loopholes which are now built up. In the upper storey to the west a fireplace and chimney in the thickness of the wall, on the north a recess in the thickness of the wall being flush with the rest of the building, leaving a small doorway at the east end. This recess is sufficiently large for a person to sleep in. On the south a recess in the wall supported by an elliptic arch 4 feet (?) in span. The square tower is connected to a circular one standing at its south east corner, the communication from one to the other being protected by a wall in which, on the south side, is a door, the principal entrance, which is 5 feet high. The door posts are solid blocks of quartz rocks about 14 inches thick. The door on the inside was fastened by 2 iron bolts that ran from right to left and a strong beam of timber, the groove for which still remains. The door into the round tower is 3 feet wide by 2 feet 2 inches, its diameter 10 feet 6 inches, has 5 loopholes on the ground floor, had an upper storey and a castellated terrace, protected by a flank defence, the south and east side of the square tower. The trace of the foundation of a small building still exists to the north of these towers, doubtless once connected with them. 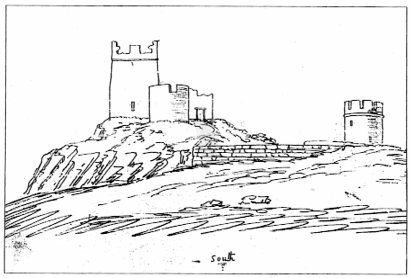 A round tower, now detached from the main body of the castle, stands a few yards to the south east, and a strong wall from it, embracing a small enclosure to the rocks on the sea-coast, completes this ruin. The door of this tower is 3 feet 10 inches by 2 feet 1 inch. It has 5 loopholes on the upper floor and a castellated terrace above. There are six loopholes below. The wall at the door is 2 feet 2 inches thick and 3 feet 3 inches at the loophole. They are 2 feet high by 2 feet 2 inches wide on the inside, terminating about 12 by 6 inches. This castle formerly belonged to the O’Doherty family. There is a landing place for boats to the west of the square tower, within a stone’s throw of its battlements.